LITTLE ROCK, Ark. - Our Victory over Violence campaign is partnering up with a community event taking place next month. 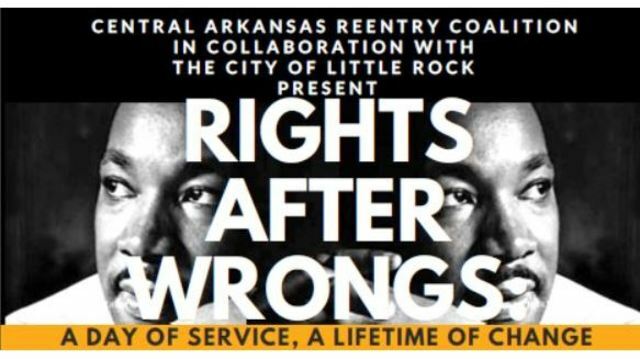 It's the 2019 Rights After Wrongs: A Day of Service, A Lifetime of Change being sponsored by the Central Arkansas ReEntry Coalition in collaboration with the City of Little Rock's Racial and Cultural Diversity Commission. In honor of the Dr. Martin Luther King, Jr. holiday, this is a community effort in which a network of attorneys, social service agencies, civic groups, faith-based institutions, public and private entities, and volunteers are coming together in the spirit of service to provide citizens with a variety of needed resources and assistance – all under one roof. The hope is that this “one-stop”, day of service event will provide families, returning citizens and people in transition with the help they need to potentially change their lives. Services offered will include legal aid, job readiness assistance, employment opportunities and more. 2019 Rights After Wrongs is scheduled for Jan. 19 from 9 a.m. to 3 p.m. at the Arkansas Workforce Center (5401 S. University). Click here for more information and to see what is required for some individuals to participate. “Everybody can be great, because everybody can serve.” – MLK, Jr.